UPDATE #2 I’ve done a completely new walk-through tutorial with a theme that is even easier to use. Check out my review & tutorial of Divi by click here. UPDATE #1: A few of you have asked me for a written version of these instructions. I had someone transcribe what I spoke. You should be able to follow along with the written transcript and refer back to the cleaned up, written version. Let me know if you have questions! One of the biggest pieces of feedback that I received from early art business coaching courses was that there was a LOT of content to go through. People need a simple win. I put the above video together to show you how you can create a simple, clean artist website in just 10 minutes. That’s 10 minutes of watching. It’ll probably take you a bit longer to actually do it. This video takes you through the steps of signing up for hosting, installing WordPress in Bluehost, adding a great art template, adding pages, and configuring your menus so that your site is presentation ready. 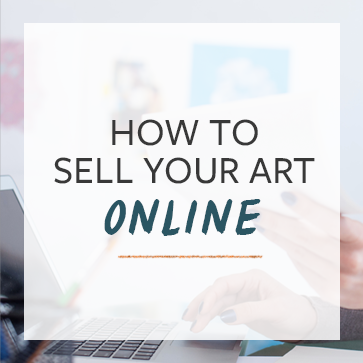 There is a lot more that you can do with your artist website, but this video will show you how to get the very basics. For in-depth tutorials, as well as help with marketing and selling your work online, contact me. You can see my short video on WordPress above, but the the even shorter version is this: WordPress is a free, open-source software that allows you to build websites without learning all of the difficult coding work that professional web developers know. If you already know some of that stuff, WordPress takes care of much of the grunt work, and leaves you free to focus on design. Here’s more on some amazing templates available through WordPress. This is great information! One question: how do you sift through all the possible themes out there? Even just limiting yourself to the free ones, there are so many! @Barbara J Carter There are indeed a ton of themes out there, but most of them aren’t good for artists. There are really only a handful that do a good job of creating a gallery style layout for all of your images. Perhaps I’ll publish a list of the ones that I like. Hello Cory, in general thanks for everything. @CoryHuff That would be tremendously helpful! @creativesque let me know if you have any questions! 1) Does blue host carry all of the ‘themes’ on the wordpress.com site? Do they carry other free themes and how are they displayed or accessible? I noticed in your video that you already knew the one you wanted to download. How did you know that theme was available? 2) I read a few years ago that themes on self hosted sites don’t have stats counters or access to the stats that WP provides on the .com sites. Is this so? I would like to have a stats counter. Thanks for your help with this. Now I’m going to explore your site! great question John. WordPress.com is a free blogging platform, like Blogger. WordPress is a software that you can install on a server and own your own website. There are a number of reasons to own your own website, but essentially, it comes down to having ownership of your web presence. WordPress.com, Blogger, Tumblr, and all of the other blogging sites can turn your site off for no reason, and they don’t have nearly the functionality that you’ll need to create a proper site. @JohnGregory great question John. WordPress.com is a free blogging platform, like Blogger. WordPress is a software that you can install on a server and own your own website. There are a number of reasons to own your own website, but essentially, it comes down to having ownership of your web presence. WordPress.com, Blogger, Tumblr, and all of the other blogging sites can turn your site off for no reason, and they don’t have nearly the functionality that you’ll need to create a proper site. @JohnGregory GoDaddy is indeed very popular – but I personally use Bluehost. That’s why I recommend them. @JohnGregory@CoryHuff BlueHost or perhaps Hostgator is WAY more WordPress friendly than GoDaddy. Also I’ve waited 30-40 minutes to get tech service for GoDaddy–never had that happen with Hostgator. When I used Bluehost, had no reason to contact them. I found that the Hostgator help can help even if the issue is not hosting but with WordPress, which is very nice when you are starting out. At the time I used Bluehost, that wasn’t true then, but it was a couple of years ago. Hosts change and Bluehost was going through some growing pains at the time. Hi Cory, I thought I had posed a question, but I don’t think it worked! First of all, thanks so much for making the video and for sharing your information. I’ve considered moving my wordpress site to a private host but I had a question that I would like to ask you. How do you find the ‘themes’ for wp. As you know, on the free site, they are all there from the dashboard. Does Bluehost also have free themes? Also, does Bluehosted sites have stats counters? Thanks. I look forward to your answer. @flora.doehler There are 2 ways to find themes. There’s a search box within your WP dashboard, or you can Google them and download a zip file, which you then upload to your WP dashboard. Either way, it’s super easy. Instead of using a stats counter from your web host, just install Google Analytics. It’s free. The Google Analyticator plugin will do the installation work for you after you create your Google Analytics account. @CoryHuff@flora.doehler You can go to WordPress.org and search themes as well. I recommend that over googling it as many times you have no idea who wrote the theme and some people write WP themes with hidden code in the footer that can have nasty stuff in it. @kokomeezer@CoryHuff@flora.doehler Thanks Cory, thanks Koko! I took the leap and got myself a hosting site….in my case I went with @HostPapa because they are Canadian, and I liked the idea of the servers being in my country. Both ThemeTrust and HostPapa have be really good about giving support and answering questions within 24 hours. I (think) I am using Analytics, but I still miss seeing the numbers in the sidebar. @teeco71 RT thanks man! I hope all is well! Good energy to you! Thanks for the very helpful video. I’ve built and maintained my own sites for several years but used Dreamweaver and have grown weary of trying to keep up with that technology (instead of painting for a living). And for years, I’ve been looking for something to use for some new sites. I’ve tried Joomla 4 times and failed:-) Tried Drupal today…nope. And I even tried WordPress quite awhile ago and didn’t do so well. But I think your video made the difference. Thanks! Hi, Cory. Thanks for the very clear and illuminating instructions… I’m not as quick as you are but my site is under construction and I hope I’ll be done quite soon. I have only one question: I would like the posts page to show images only and not part of the written content too, but I can’t find out how to do this. Can you help? BTW, the theme I chose is WP Twenty Ten 1.3. @ElenaSeccivonDeck Thanks for stopping by Elena. Glad it was helpful. I offer individual consultations for situations like these – click on the Home page for info on individual coaching for your site. Its really nice and useful very much post Thea,cool! really nice and useful very much post Thea,cool! Hi Cory, Thank you so much for your awesome video tutorial! I went ahead and registered with BlueHost and created my website name. However, I have no idea how to link it to my past wordpress site. Now, I have two completely different websites! One with a fresh clean slate, and the other with my past entries. How can integrate the two? I would export the content from your old site and import it to your new site. In your Admin menu, go to Tools > Export and the rest is fairly intuitive. Stupid question, Cory, so you don’t need to register your account on WordPress, it will be just enough to register domain name at BlueHost for free and I can use all features of WP you’ve shown in your great video, right? @ngoloskokova No need to register with WordPress. You’re not creating an account with WordPress.com – you are installing their free software on your own server. How do you get that nice sans serif font you have on your Leonardo site? Mine has a newsprint-style serif font and I can’t find an option to change it. OK, I figured out how to do it; you go on Theme Options under Appearance and click “OK” for Helvetica/Arial. But now I have another question: is there a way to get rid of that comments section at the bottom of every page? Thanks everyone! @ChrisKing1 You have to remove comments on each individual post. At the top of the page, click Display Options > Discussion. Then, scroll down to the bottom where you’ll find two checkboxes, one for Comments and one for Trackbacks. De-select both of them. Hit save. Just one question: How do you edit what part of the image is shown in the thumbnail? I have attempted this several times but to no effect. @TomWray unfortunately there’s no easy way to do that without delving into the code. Thanks for the great tips.You have shared such nice post.Its really a great info, great post. You have to store your website files on a computer server. Hosting companies handle all of that for you. Cory, but why isn’t wordpress enough? I don’t get the necessity of a host also… It’s true I’m not a techie, but I thought it’s enough to just upload the files to your wordpress blog and visitors will see them there, right? So I understand wordpress servers store these files beyond this point. Would love if you’d made it clear for me. Thank you! Excellent video, I use Word Press for my blog, and leaned a few new things. You have a great way of explaining the tech stuff. Keep up the great work! Great instruction video for WPFolio. My question: How do you remove the Comment box at the bottom of the home page? When I try to log into the site, it will not accept my email address, even though I am already on your list. Is being a member different from being on the email list? Hi Trish, yes they’re different. Being a member of the courses requires paying for them. The email newsletter is free and goes to your inbox. Does bluehost remove the wordpress ads or is that something you still have to pay for? There are no ads in the WordPress software. Thanks for the video, it looks very easy. However, we’re trying to create a gallery where people can buy our artwork from our website & I think you mentioned (probably in another post) how to create a shopping cart on WordPress as well. Do you have a video for that, too, or is one forthcoming? Hi Alyx – I’m planning to do a video some time in the near future. I usually use Woocommerce. Hi Linda, there is a link to download the transcript below the UPDATE paragraph, below the video. Thank you for all your help and inspiration. I have searched through many of the newer themes and have found “Titan” to be absolutely amazing. It is responsive, features full page photos, sliders, galleries, portfolios and e-commerce. How can I protect my images there from being stolen (click and save or download)? I know about watermarks and small files, but if this theme uses large images, how can I be protected? I enjoyed trying Fine Art America, which has a built-in protection, but I want my own site without links to their entire artist community. What do you suggest I can do in conjunction with “Titan?” I discovered the plugin “sell media”, but that would duplicate the sales function already found in this theme. Sarah, make sure the images you upload are 72 dpi. This will prevent people from printing your images. Beyond that, use a small watermark. I wouldn’t worry about the right-click problem. Even if you stop that, people can just take a screen shot. Thanks for the info. Have been using wp with photocrati theme. Want to pull all my far flung images back to my site and still keep a presence on Twitter, Facebook, Flickr etc. The idea is to drive traffic back to my website so visitors can have a better coherent experience of all the services I offer. Can you suggest other WP social media resources? Thanks for all the great information. I have a ways to go before i exhaust the depths of your generosity but i’ll speak up anyway. I recently purchased a fancy theme for my wordpress art blog (before i watched the how to build an artist website webinar and realized i was being too fancy). The problem is all the fancy stuff is making it load a lot slower than my hand built sites or my regular responsive free wordpress template. I read somewhere (probably here) that after 4 seconds people start to leave. I have always valued fast loading over a lot of fancy stuff and eschewed flash and splash pages so this theme direction is heading the wrong way for a practical website. My advice is before you buy test the demo. Make sure to remove frames (there oughta be a button at the top for that) If the dang thing isn’t getting a good grade on their servers with their setup then don’t buy. Evan outdated, this video was excellent. Thanks so much for getting me started. Next, I need to figure out how to allow for transactions on my site. Can you recommend where I go to get this added? Woocommerce plugin for WordPress will do it. I’ve been generally happy with WordPress, but they are changing the interface around a bit and I’m not particularly pleased with the results. Hoping they are just in transition to something more workable. Thank you for this clear and simple guide! I have my current site and blog hosted for free which wasn’t a problem until I came to develop the commercial side of being an artist. Then you find you are fairly ‘invisible’ to all the analytics that help in generating sales even with your own web address pointing towards the free site. Also, I entirely agree with wanting control over your own site, it is no way to run a business where the plug can be pulled on you at any moment. Hi! First let me say thanks for running this website, this is going to be invaluable to me as I get started selling art professionally! I am having a problem though. I registered with bluehost and installed wordpress but when I searched for wpfolio there were no results. I did find a theme called “Portfolio” that seems similar but am struggling with setup. I found a tutorial elsewhere but the options they’re telling me to look for are either not there or hidden somewhere I don’t know where to look. I was wondering if you have an updated tutorial I’m missing and could point me that way? Or any help really lol. Thanks in advance!! I went toBluehost for my hosting and they said 6.95 per month for hosting plus cost of domain (11.99). I also opted to ad security and something else,about 40.00 total. Imagine my surprise when I received my reimbursement which I ended up having to ask for because. Nothing worked from my iPad for 357.99! They charged me for three years! And I never got a receipt until I demanded my money back. Maybe there was some ittybitty print somewhere that said they would charge for 3 years, but it sure was not disclosed in the entry offer. In my estimation this could constitute fraud, or at the very least, deception, so beware of blue for the three YEAR charge, for those looking for a less expensive deal. As an important addition, their service person was great and they are giving me my almost400.00 back from my bank account after the 5 to 8 business days. Always read the website terms & conditions. Every company offers different deals at different times. Be sure you know what you’re getting. Thanks for your help. You have some great ideas. This is pure gold, Cory! So I’m getting ready to take the plunge and put up my website going with bluehost as my host. Do I still have to pay for the WordPress hosting as well? That is, do you just pay bluehost and then use the software which I’ve been told is free by a friend, or are you having to pay for host and website software both? Elle, you pay for hosting. The rest is free. This video has helped me to switch to WordPress. WP folio is no longer available. After looking through the other free templates, I decided to go with Divi. 1) How can I sell through my website. 2)How can I have a bigger audience. I understand its though the use of keywords, but I don’t understand where to add them or how. This is really helpful! Thank you so much for the info! I looked at the website platform list that you recommended and noticed Wix is not on there. Is it not a good platform for starters? I have been looking into different ones and am torn between WordPress since I have a blog on the free platform and wix since it user friendly.